Vertical adjustment 1. Up Pull the head restraint up. 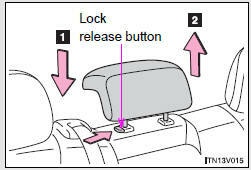 Push the head restraints down while pressing the lock release button. Vertical adjustment 1. Down Push the head restraint down while pressing the lock release button. 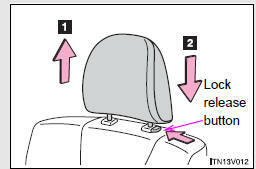 • Use the head restraints designed for each respective seat. • Adjust the head restraints to the correct position at all times. 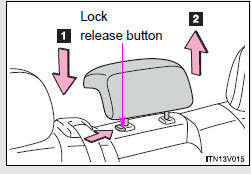 • After adjusting the head restraints, push down on them and make sure they are locked in position. • Do not drive with the head restraints removed.